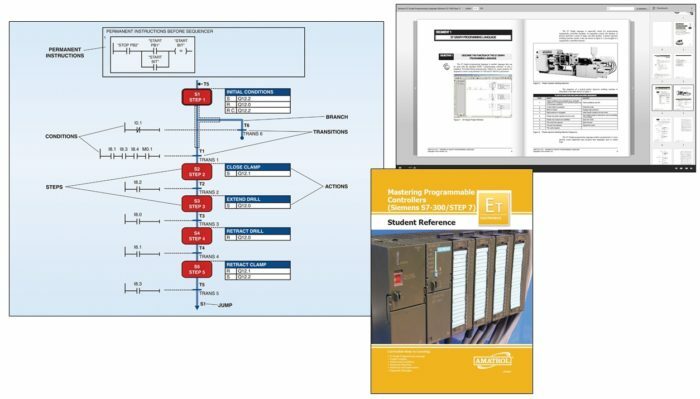 Amatrol’s PLC Graph Programming Learning System – S7300 (89-GP- S7300) provides training on S7 Graph, a flow-chart based language used to program machines to perform sequential control applications for Siemens S7-300 processors. This S7 Graph course covers: how to create and monitor S7 Graph projects; how to enter the basic structure of the steps, actions, and conditions contained in a sequencer; and how to add branches, interlocks, supervisions and diagnostic messages to projects, which help to detect and report errors during sequencer operation. The S7 Graph language is especially suited for programming sequentially controlled machines such as plastics injection molding or clamp and drill machines, to name a few. The programming language is becoming popular in Europe and is used on specialized machines brought to the US. Maintenance personnel in the US automotive and machining industries will need to understand the S7 Graph language in order to work on these machines. A sample copy of this course’s Student Reference Guide is included with the learning system. Sourced from the multimedia curriculum, the Student Reference Guide takes the entire series’ technical content contained in the learning objectives and combines them into one perfectly-bound book. If you would like to purchase additional Student Reference Guides for your program, contact your local Amatrol representative for more information.